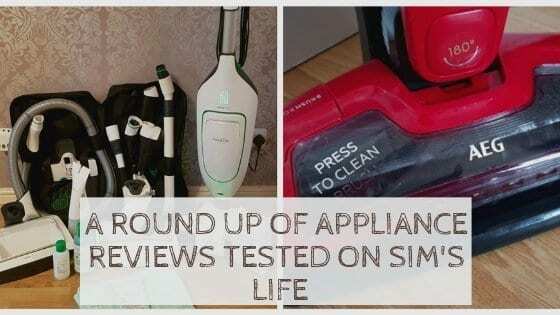 It’s time to have a reminder of all the fantastic appliance reviews featured on Sim’s Life. A lot of the products sent through for review over the years are still used in our house now, showcasing the longevity of the items… that and how much we enjoy using them. We are very fortunate to be in such a position to be able to review such items, however there is a lot of time and effort that goes into testing and writing a review that will help other’s searching for that product. As time passes the reviews get pushed further into the blog, so it’s great to have a little reminder of what we have actually worked on! The AEG Cordless Vacuum Cleaner review was fun to work on, with the cleaner proving to be a great hit in our house. Super easy to use and very lightweight, this rechargeable vacuum also features a handheld unit, making it a 2-in-1 cleaning system which is perfect for smaller households. Crossing over from laminate to carpet with ease, the cordless vacuum cleaner makes easy work of what can be seen as a chore. It is still used daily in our house and even Liv enjoys using it… bonus! There is no denying that this cleaning system is a beast, that will have your house sparkling in no time! The Vorwerk Kobold VK200 review was an amazing opportunity for Sim’s Life and I do have to admit to have fallen in love with the system, however not the price! Check out the review to find out how much it actually costs… but also why it has that price tag! It is a superior system that not only acts as a vacuum, but mop all in one – with extension packs that enable you to clean carpets, freshen up mattresses, get into the hardest of corners and more. I seriously do miss not being able to use the Kobold VK200, but am glad we got the opportunity! For coffee lovers with limited work top space, this is the ideal filter coffee machine, packing a lot into such a small/medium sized unit. The Ninja Coffee Bar review came at Christmas time and meant that coffee flowed freely to provide fuel for what was a busy period. Easy to use and clean, a carafe of coffee providing enough for 8 cups can easily be knocked up and ready in 8 minutes. Included in the kit is the actual unit, carafe, milk frother and 2 plastic mugs, making it a bargain coffee machine for under £100. This too is still used most days! It was quite novel reviewing a printer that required you to pour ink into it as opposed to inserting an ink cartridge. Offering sturdiness and a quick print, the selling point of the Epson EcoTank review was the fact that single bottles of ink would offer 2 years worth of printing (over an average number of pages printed). Now, I admit I do not print regularly however, even 3 years on, I have still not had to top up the ink and the printer is still cracking on. For a family household, it is a total workhorse and it’s reassuring that I can just turn it on, use the wireless printing option and know that it will print away even when not used regularly. Just a few of the fantastic appliances that we continue to use in our house (minus the Vorwerk Kobold VK200), that have proved to be long lasting assets to our family and definitely deserve this updated shout-out! The Vorwerk is an amazing cleaning machine, so many different tools available for the whole house.